The March 14th 2013 meeting was from 6:00 to 8:00 pm at Avant Assessment’s offices at the Harris Square Building. 1800 SW First Avenue, Portland, OR 97201. The past few meetings of the cluster we have talked a bit about how companies market themselves so we thought it would be a good chance to hear from a company that helps Education Companies market themselves. "DemoCrafters is a leading producer of demonstration videos that explain, sell, inspire, and teach. At DemoCrafters we create custom-built videos that maximize the impact and effectiveness of our client's training, marketing, support, and sales messages. Founded in 2006, DemoCrafters is headquartered in Portland, Oregon." The NW Ed Cluster met on Tuesday, September 18th from 6:00 to 8:00 pm at Hot Lips Pizza on Hawthorne (SE Hawthorne and 22nd) and is hosted by Clarity Innovations (www.clarity-innovations.com). Thanks Thor and Clarity Team! a. Who are you, why are you here, and what's your favorite pizza/beer? a. Where we have come in the last nine years. b. Brainstorm/discussion on where we can go in the next two years or so. WHAT: Lightspeed Technologies’ CEO and Founder, Jerry Ramey, talked about the history of the company (they have been around since 1990! ), its business model and then demoed their classroom audio products. WHO: Jerry Ramey –CEO and Founder, Lightspeed Technologies, Inc. ADMISSIONS: Free and open to the public. Reservations are requested. We had a good session at the Oregon Leadership Summit in December - see below. Update to the December Oregon Leadership Summit. The NW Ed Cluster hosted a breakout sesson at the Leadership Summit. The session provided participants with a better picture of Oregon’s current Education Technology Industry and how local companies are thriving in today’s environment. 4. Allow for the application of a growth measure (not tied to a grade level) to be included in the NCLB waiver that Oregon is requesting from the Feds. The NW Ed Cluster hosted the Oregin Cluster Network meeting on Measuring Industry Cluster Competitiveness on Jan 23 from 2-5 at NWEA. The meeting included an overview of My Big Campus – by Light Speed Systems followed by a panel discussion presented by The NW Education Cluster and The Light Speed Systems on Social Networking and the Education Market. EdNET this summer in Boston had a keynote speaker talk about how Social Networking is reshaping customer relationship management, product development, and marketing in the Education Market. How is social networking used by NW Ed Cluster members? Come hear from social networkers at some local companies on what they are doing on Facebook, Twitter and other online tools for connecting people. The September 23rd meeting of the NW Education Cluster was hosted by the Math Learning Center (http://www.mathlearningcenter.org/) It was the last in a continued series on grant writing, funding and school district spending. A panel discussion presented by The NW Education Cluster and The Math Learning Center. The past few NW Ed Cluster meetings have focused on grant writing and funding opportunities from a cluster company perspective while this one turns the table and asks what activity are local school districts and the department of education doing around grants and funding issues. Come and hear from the people that are doing this daily at the district or DOE level. Micah Baker - former Technology Specialist at Oregon City School District now with Apple Inc. The June 7th, 2010 meeting of the NW Education Cluster was hosted by the Ulum Group (www.ulum.com) and DeVry University Portland Campus. Patrick Riccards - CEO of Exemplar Strategic Communications, a consulting firm that specializes in strategic planning, public affairs, and advocacy in the education space -- gave an overview about education tech funding landscape in Washington DC, provided his analysis, and answered questions. Patrick is the founder of Educommunicators (www.educommunicators.com), a social network for education communications professionals as well as the author of http://blog.eduflack.com, a 3 year-old blog covering education policy issues. The February 4th, 2010 Cluster meeting was hosted by Casio Education Technology M.R.D. Center (www.casioeducation.com) at the Lincoln center located on the second floor of Tower 2 in the Lincoln Center business complex in the Washington Square area of Portland Oregon. 1. How well are folks doing in this economy? 2. What strategies have you found to get by? 3. What signs do they see of the economy turning around? 4. Anyone seen the stimulus dollars yet? 5. What are the biggest challenges are cluster firms facing operating an education business here in Oregon in the next 12 months? 6. What makes Oregon (and/or Portland) an attractive place for your business? 7. What could make Portland even better for firms in the education industry? 8. What additional companies and services would you wish to attract to Portland? 9. What can local and state governments do to help drive economic development of the educational industries in the next 12 months? The Wednesday, May 20th 2009 meeting was hosted by Learning.com (www.learning.com) and featured a discussion on what Learning.com is up to, how they partner with other organizations in the Portland area and how they are working with schools in this new economy. Bill Kelly, CEO of Learning.com talked about many of the product offerings Learning.com has released lately and how they are positioned in the market place. One highlight was their Digital Learning Environment that was just named a SIIA CODIE Award finalist. The February 19th 2009 meeting of the NW Education Cluster was hosted by Schoolhouse Supplies (www.schoolhousesupplies.org) and featured a discussion on the how the education sector is seeking innovative partnerships and creative solutions to persevere in this rough economy. Schoolhouse Supplies highlighted how they are growing their newest program called Schoolhouse Supplies Online to encourage more parents to buy their children’s supplies through Schoolhouse Supplies as a convenience for the parents and earned revenue stream for the organization. There was a great round table discussion with Gayle Kellman – Executive Director of Schoolhouse Supplies – where she kick started the conversation with Schoolhouse Supplies’ own example. Also check out the April 2008 column "Northwest Education Cluster: A Continuing Saga" on the meeting about Accelerate Oregon and the January 2008 column on "Consider the Northwest Education Cluster" as well as the blog entry by Fred Phillips, one of the founders of the cluster, titled cluster bucks. The November 12th 2008 meeting of the NW Education Cluster was hosted by Inspiration Software (www.inspiration.com) and featured a panel discussion on the current state of hiring and recruiting in the education market here in the northwest. The panel will include members from Inspiration Software, Insight Schools (www.insightschools.net) and Jack Farrell & Associates (www.jackfarrell.com). All three of these organizations have a local presence and can speak about their hiring and recruiting practices. The panel was moderated by Alia Jackson. Why: In this uncertain economy, hiring and retaining talent in any industry is becoming more important. Will HR departments have to change their approach in the way they recruit and retain employees in the coming months? In the past 2 years Insight School has hired over 450 in over a dozen states, Inspiration Software has also been hiring and retaining valuable employees and Deb Postlewait of Jack Farrell has worked to bring educational recruitment to the northwest. This is a great opportunity to learn about what 2 great local educational organizations have been up to as well as how recruitment can be a part of either a hiring or job seeking decision. Each of the panel members spent about 20 minutes talking about their organization and their hiring and/or recruitment practice and then there was time for questions and answers. This message was prepared for an outside blog but since it is more introspective we felt it would be better if just the cluster saw it. One of the main reasons the NW Education Cluster exists is to share ideas and network with other like minded companies and organizations that provide services to the K-20 market. Just last week many members of the NW Ed Cluster attended EdNet (http://www.qeddata.com/Conference/EdNet/YrCurrent/EdNet.aspx) – QED’s annual Education Networking Conference – that was held in Boston. The goal of EdNET is to share ideas and learn about what other organizations are doing in the K-12 space. The NW Education Cluster starts all of their meetings with short introductions from everyone in attendance and so did EdNET. Everyone had 30 seconds to go on-stage in front of 450 people to talk about their organization and what they hoped to get out of the event. I was impressed with the energy and the turnout. It was the same type of energy that I see every quarter from a NW Ed Cluster meeting – only our meetings don’t involve a plane ticket or hotel room or the $1,000 conference fee! Two events from EdNET stood out in my mind as useful and impactful to our cluster. One was Doug Stein of Memespark giving a 5 minute Foresight talk “How Can We Afford Differentiated Learning on a Mass Indoctrination Budget? Where could/should K-12 schools and the marketplace be in five years and how do we get there?” His talk on use of data and differentiated learning hit a chord with me – many of the products and services in the Cluster attempt to do just that in the K-20 market. Here is the outline of his presentation. ...all working together in a virtuous cycle that empowers children to be creative agents (as opposed to passive receptacles or trained parrots). One of the challenges in current practice is that it is more focused on homogeneous instruction for heterogeneous groups. We build one linear scope and sequence based on one set of standards (per state), buy one set of materials correlated to the same standards, and then hope we create a complete 'coverage' in a student's mind - but measure this indirectly with uniform directed-response testing. Instead, we should seek the construction and *direct* measurement of 'effective' concept maps within each child. Materials and experiences should be chosen for their 'scope and composability' instead of scope and sequence. They should be adaptive and active instead of uniform and passive. Assessment should be an ongoing process of measuring each child's emerging coverage of a nonlinear coverage map and progress along a psychometrically-valid linear scale. Finally, the effectiveness of the school, teacher, class, and student's year should be measured by 'growth' (educational value-add). The techniques of data-mining (especially segmentation and prediction) and social networking should be used to assist the student and teacher in identifying how to navigate a concept map in a way that supports both individual learning and group collaboration. The second was a conversation I had at an evening networking party with Deb Postlewait of Jack Farrell & Associates and Andrea Sutherland of Inspiration Software on what the topic of the next Education Cluster meeting could be. With so many organizations and recruiters in the mix at EdNET there was some energy around how do companies and recruiters work together and each can leverage the other most effectively. This gave us the idea to potentially reserve our next cluster meeting talk about it. We thought there could be three things discussed. I was a guest columnist for http://www.edbizbuzz.com/, a daily online Education Forum by Marc Dean Millot that is covered in EdWeek. I wrote about the NW Education Cluster (Northwest Education Cluster: SY 2008 Goals and Progress ) and the meeting is progress towards our 2008 goals. This is part of a quarterly guest column will help bring us more exposure going forward. Let me know what you think. This NW Education Cluster meeting was hosted by cluster member company Saltire Software. Phil Todd of Saltire Software has for a long time offered to host a meeting but due to the space configuration of his building/office it has been difficult to set up. We have come up with a neat solution of having 3 presenters do round-robin presentations in three rooms in his building. This would be a "speed-dating" kind of presentation where the presenters would end up doing their presentation 3 times to 3 different audiences. There will be networking (and pizza) from about 6:30 to 7:00. 1) A representative of one of the local business schools (Willamette University’s downtown Portland MBA program) talking about the work they do, and more generally, how to work with academics. 3) Phil Todd talking about Saltire Software with a presentation by their own Saturday Academy intern on the work they are doing. The next meeting of the NW Education Cluster will be January 8th 2008 hosted by NWEA (www.nwea.org) and featuring information from The Chalkboard Project (www.chalkboardproject.org) and Portland Schools Foundation (http://www.thinkschools.org/), 2 great local organizations. Why: The NW Education Cluster in the past year or so has become more outward looking, with the New York Times article this summer to meetings with The Portland Development Commission, The Chalkboard Project, The Oregon Leadership Summit and the AESA. This is a great opportunity to learn more about 2 unique organizations located here in Portland that can potential work with not only the NW Education Cluster but with each member organization. There will be networking (and pizza) from about 6:00 to 6:30. The Portland Schools Foundation and The Chalkboard Project will each spend about 20-30 minutes talking about their organization and then there will be questions and answers. Please RSVP to me. The space is limited to about 35 people. Look forward to seeing you there! It was great to see many of you at the Oregon Leadership Summit on 12/3/07. Don Spear (BlueTech), Deme Clainos (StudyDog), Brian Rose (InsightSchools), Stephen Peters (Opensourcery) and I represented the NW Education Cluster at the breakout lunchtime roundtable. Also at the roundtable were Susan Castillo (Oregon State Superintendent), Senator Richard Devlin (Senate Majority Leader), Kristin Bryant (Chalkboardproject), someone from the OEA and the Governors’ Office as well as our facilitator Sam Brooks. It was a tight table and we covered a few topics in the short hour we had. There were about 60 people in the audience and it was a lively discussion. Education Week just this month came out with report ranking Oregon low in technology and staff development. 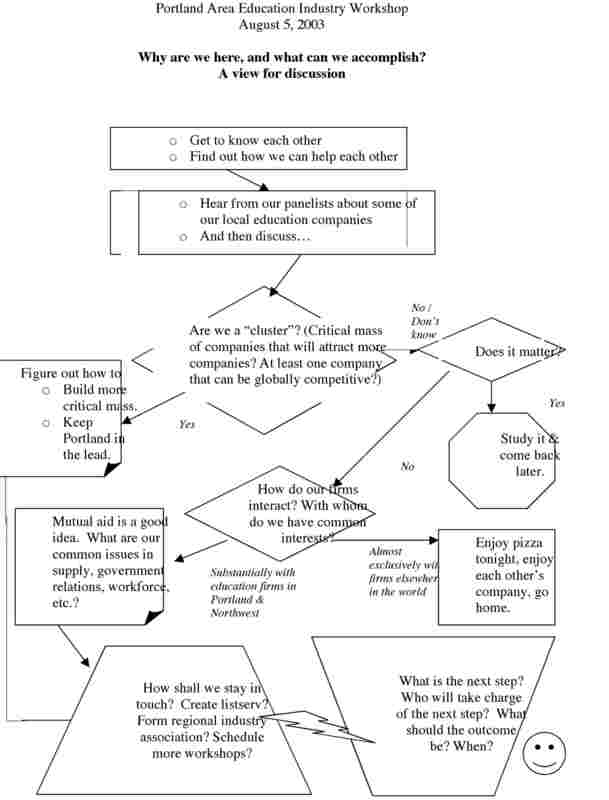 How can we all work together to focus the energy in Oregon to support specific goals using local companies’ expertise? A summer Education Summit where educational companies could share their ideas and technology with state education leaders. In building a strong brand, how do you craft a single story that is equally appealing to a 17-year old soccer player as it is to a 53-year old CEO? Join us next month to learn about the challenges the University of Portland faced when wanting to increase awareness of the University and its strengths. The secret to their success has been in conducting solid research with all the right audiences. In this session, you will learn how the University of Portland and The Discovery Collaborative designed a comprehensive research program that resulted in a single framework for the positioning of the University with a broad range of audiences. Terrace Room located in the University Commons Building (downstairs from the student cafeteria). There will be socializing starting at 6:30 and the meeting will be starting at 7:00. We will also share some highlights about the Cluster and the Oregon Business Plan. The Software Association of Oregon’s educational foundation, TechStart, is underwriting advanced teacher training at Western Oregon University next week (July 30th through August 3rd) and has approached the Northwest Education Cluster about a sales and marketing opportunity. This training, called “SuperQuest”, is a highly acclaimed training series for K-12 technology educators who are seeking to develop and sharpen skills in teaching robotics and computer science. On Thursday, August 2nd, from 4-6PM, there will be an “Industry Meet and Greet Resource Fair”. This is an opportunity for members of the Northwest Education Cluster to meet with the 40 participating teachers in order to teach them about the latest products available for their classrooms and school districts. The event will occur after class on Thursday and includes a casual reception with appetizers. This year, ITT and Microsoft are among the resource fair sponsors. Who? About 40 technology (computer science, robotics, engineering) teachers from Oregon and SW Washington who are attending a week-long training and conference about using the latest technology in their K-12 classrooms. Sign up or Ask Questions? Mark Fulop, MA, MPH – An experienced grant writer for the nonprofit sector. Cognition Ignition - An experienced grant writer for educational media. It featured three CEO's from Portland Education companies/organization, all at different business stages, discussing how they move forward to meet goals, over come setbacks and what motivates them. This meeting was sponsored jointly by Knowledge Learning Corporation and their subsidiary KC Distance Learning. This event included a panel discussion to talk about the Internet and its impact on traditional business models and education. The panel included members of the education business community using the web in unique ways to build its education business, members of the open source technology to discuss its impact, and members from a local school district that addressed how schools' look at various technologies and their integration. Also on hand were members from Knowledge Learning to talk about what they have been up to the last few months. people with more information. The brochure was created by Levi Ness of TwentyTwo38. He had designed our logo and offered to help again with the brochure. It looks great! A link to the pdf version is here. is the Conversation: How your content can create a relationship with your customers." It is never too early to start thinking about Fall - which can be a busy time for everyone. So your web presence or email program has become one of the most important marketing vehicles for your brand. Now what? You need content. Powerful, amazing content to facilitate the conversation and engage your customers in a long-term, mutually beneficial relationship. This open discussion will examine the common mistake companies make in developing content and show you how to delight your customers in order to promote loyalty, evangelism, acquisition and, ultimately, sales. Circa 1998. Wendi Flores-Spiess and Steve Klinetobe combined their superpowers and created Curiosity, a nimble, strategic, and smartly creative agency in the business of developing amazing user experiences. Now, many late nights and several disgruntled office managers later, they employ over 30 strategic thinkers, designers, writers, and marketing professionals from a variety of backgrounds. The place buzzes and the people fly. Curiosity does all the things you’d expect for an marketing agency to do: websites, e-mail campaigns, interactive experiences, direct mail, and so on. But there is something different—a slight, but powerful, variation. They are driven by a belief that everyone deserves to be treated like an individual, like a human. There is no Mass Market; there are only individuals. Curiosity delivers an experience rich with emotion, truth, and relevance, and in return, our clients get conversion and loyalty. Curiosity’s clients include the likes of Apple, HP, NWEA, Paramount Television, Disney, Vesta, LightScribe, MacForce and Bonfire Snowboarding. around the area and metered street parking. a showcase lab school here in Oregon. Education Cluster members and others have all informed about the Tech Fair. Here is information about the next education cluster meeting that is happening on February 21st from 6-8pm.this meeting is sponsored by Renaissance Learning. 4. How could and how does Renaissance Learning interface within the Education and student community? 5. How can we as a cluster help Renaissance Learning further their objectives? 6. How can Renaissance help other cluster members to further their objectives? 7. This could then progress into more about the differences between the Washington education climate and Oregon's and their respective business climates. Finally leading into a discussion as to how entrepreneurs could exploit opportunities within that framework as well as Q&A. Where: Renaissance Corporate Services, Inc. Please RSVP to me. The space is limited to about 35 people. Look forwardto seeing you there! Hope everyone is getting ready for the holiday season and can take at least a few days off. First from the last meeting on Nov 30th hosted by OETC and StudyDog there was a bunch of information presented that I wanted to update people on. - Here are the two web addresses for the two conferences that Kurt Gazow recommended at the Nov 30th meeting. These might be of interest for companies to attend in the future. - Elizabeth Redman spoke about the Oregon Leadership Summit happening on Jan 9th. Registration and more information can be found at http://www.oregonbusinessplan.org/. The Education Cluster will be represented through the Software breakout session and Mona Westhaver from Inspiration Software will be participating in the panel discussion. I will be in attendance and hope that you will be there, since the focus on education is relevant to all of us. - We are still in the planning stages for the next meeting with more information to follow after the 1st of the year. If your company or organization would be willing to host the next event as well as talk about your product or service please let me know. Hosting is easy and a good way to get your message out about what you are doing and how you are growing. November 30th from 6-8pm. This meeting is sponsored jointly by OETC and StudyDog. RSVP information is at the bottom. to gain more access into the K-12 education community. OETC in the spirit of K-12 education community has secured space at a local middle school. StudyDog has offered to provide the food and refreshments. make for a lively discussion. cannot attend but would like that option. Here is the final invitation to the next education cluster meeting that is happening on August 23th from 6-8pm. If you have already RSVP'ed no need to do it again. We have over 25 people confirmed in attendance. * What are the top 3 purchasing priorities for your school or organization in the 2005/2006 school year? * What is one piece of advice you can give to these business leaders about developing or marketing products for the education field? Aaron Munter - Director, OETC, an organization dedicated to maximizing the value of educational technology to its members by working with software and hardware vendors to procure the most effective and appropriate technological resources at the lowest possible price. A third mystery panelist - check the website for more details! Please RSVP to me or Kelvin (kelvin.n.ng@msdw.com.) The space is limited to about 35 people. Look forward to seeing you there! You will also have the chance to vote on our new cluster logo - thanks to the work of Stephen Peters and his team at Amazing! We have the selection down to 2 and need your help - must be present to vote! and did not attend these notes should help serve as a road map as to where we hope the Cluster will go in the near future. appreciated all of her comments and suggestions -- keep them coming. that "if we are to continue to grow, each of us must not only continue to attend these meetings but also invite a friend to come." Thanks for the energy and continued interest in the Portland Education Cluster. With the rains returning it reminded me that the next quarterly meeting of the Portland Education Cluster must be right around the corner. Here are the details of the upcoming meeting. We are going to have a bit different format this time. We have been meeting for the past two years now so it is a good time to take stock in our future and see where we want to go. where we would like to have this Cluster head in the future. Everyone is welcome and expected to participate. 1) what does an Education Cluster mean to you? 2) what do you hope to leverage from these events and what else would you like to see? 3) how can we all better interface within the education and student community? 4) how can we as a cluster do more? We are growing and thriving and it is thanks to all for the help and support. I know with all that has been happening there is a great deal to talk about and this will be a great meeting with many ideas exchanged. Please RSVP to me or Kelvin (kelvin.n.ng@msdw.com.) The space is limited to about 30 people. Look forward to seeing you there! universities - like 3M University. 6) How can we as a cluster help you further your objectives? outsource from lower costs countries like India and China. This will be followed by some Q&A and the meeting should end around 8:00pm. about 25 people. Look forward to seeing you there! I hope you have all had great summer and with school (and the rain) starting you have begun to think about the next Portland Education Cluster Meeting! I know I have. Well, keep the evening of Thursday, October 7th open for the next planned meeting. More details about where it will be held and the agenda, will be sent out as we get closer to the date, but judging from the last few meetings it should be exciting and very thought provoking! This is a motivated group. We have also changed the URL of our website! The new website is www.portlandedcluster.com. Fred Phillips, the long time keeper of the website and strong and generous supporter of PEC, has moved to Holland to the Maastricht School of Management as Professor and Associate Dean. We wish him well at his new position but will miss his presence at the cluster meetings. New on the site is a great article from the NY Times that demonstrates that being a member of the Portland Education Cluster can really pay off. More details about the meeting will be posted once the site as well as information about new member of the cluster. Check it out... www.portlandedcluster.com. On the website are many of our members bio's. Please check them out and send me updates or if it is not there send me yours. If you would also like me to add you email and telephone number to the site let me know and I can get them up there also. The June 7th, 2004 PEC meeting was hosted by KCDistanceLearning. 3) How could and how does KCDistanceLearning interface within the education and student community? 4) How can we as a cluster help them further their objectives? 5) How entrepreneurs could exploit opportunities within the framework of KCDistanceLearning and the Portland education community. Their talk was followed by Q&A. It was a great meeting with many ideas exchanged. this exciting, growing collection of data, how it is being used, and how it could be used in the future. NWEA just did a national study about student testing. Here is the press release about it, and the Oregonian article. The Oregon Department of Education's e-Learning Distance Education 2004 Summit took place on January 26, 2004. The Portland Business Journal covered our August, 2003 meeting, and focused on Inspiration Software. Here's the story. Inspiration Software was recently named to the Inc 500, the ranking of America's fastest-growing private companies. They have also won many awards from educators, educational magazines, and computer learning labs. The November 5 meeting featured interesting and inspiring presentations by Michael Hoskins of PersonalProfessors; Don Spear of BlueVolt; Jennifer Arns of OETC; and Elia Freedman of Infinity Softworks. Here are the details about our last meeting of the education cluster meeting hosted by Learning.com. 3) how could and how does Learning.com interface within the education and student community? 4) how can we as a cluster help Learning.com further their objectives? 5) This could then progress into more about the Portland education community and what are the needs of Learning.com. opportunities within that framework as well as Q&A. Can being a member of the Portland Education Cluster pay off? A note from Joe Meyer of Metalytics Inc.
and thought that this might be useful for some members of the cluster. See you on October 7th. MasterSolution is a developer of educational software tools for teachers. MasterSolution is a wholly owned subsidiary of a Swiss company with approximately 75% of worldwide sales generated in the US and Canada. It is co-headquartered in Portland and Madiswil, Switzerland. All development is performed in Europe but much of the worldwide Product Management, Marketing, Sales and Support is performed here in Portland. Says MasterSolution President Kirk Greiner, "I would be interested in participating in a local organization whose members are focused on providing technology solutions to the education market." We would like to invite you to attend the Technology in Education Summit on Tuesday, May 4th, which is part of the 2004 Oregon Economic & Business Forum at the Oregon Convention Center, Portland, Oregon. ISTE will be exhibiting at the Forum in an effort to raise the visibility of the importance for business and government leaders to support integration of technology in education and your attendance will help reinforce that message. Technology -- see http://www.groworegonbiz.com for more information about the Forum in general. still ( see http://groworegonbiz.com/OEBF/index.htm#2 for details about the Power Panel). Please, bring your voice and your support to the Oregon Convention Center on Tuesday morning! As an added incentive from the Forum producers, all pre-registered attendees will be eligible to win an InFocus X1 Projector, MP3 Player, or Geely Scooter. We hope to see you in Portland in May! That distance learning space is a viable business and worthwhile endeavor can be inferred from the August 21, 2003 WSJ article, "For-Profit Education faces tough course," by Cynthia Schreiber. She quoted huge growth (doubling in recent years) in internet college education enrollment and in fact posits that success will attract competition from traditional mainstream colleges, which accounted for the inclusion of the "tough course" phrase in the title of her article. It would be very gratifying for us to build and keep our education companies in Portland. So on to the next steps! Thanks for the invitation. I am very interested in attending. However, I'll be out of town that day, so I won't be able to make it. Please keep me informed of the results of the meeting and add me to any mailing list. Since I won't be able to attend the Roundtable, I'd like to send you a little information about Via Training, to stand in as a proxy for our interests. I'm not sure how well Via Training will fit in, which I guess depends on the focus of the group. We're only an education company in the loosest sense. I think of education as having to do with schools and colleges. We're more of a training company. Our clients are corporations. And we're not really a technology company, although we do have a 20+ person engineering department. We use technology (much of which we developed) to deliver courses, but it's not our primary focus. Via Training is an web-based training company. Our focus is sales training, with specialized experience in the retail channel and the computer products/consumer electronics categories. Our clients include HP, Microsoft, Intel, Pioneer, Kodak, Canon, and Motorola. None of our clients are in Portland. We are doing business in Europe and will be opening an office there this fall, so I guess we fit into the "able to compete globally now" category. Our offerings range from custom online sales training courses to complete sales training programs, including including course and site development, e-learning technology, and ongoing management. We have developed a specialized sales-training LMS with a unique points-based Incentive Management System. Our Active Learningª instructional methodology is supported by a rapid development tool--our Reusable Learning Activity Library. Via has been a modest Portland success story. Since our launch in January 2000, we have grown to over 90 people. Our revenues have grown better than 50% per year in the face of a poor economy and a contracting e-learning market. We've maintained profitability every quarter since launch. We're projecting continued growth this year. Our main problem right now is finding people with e-learning experience, especially higher-level positions. We are hiring management positions outside of Portland occasionally. There is really nothing that Portland offers as a location for our company (other than that I live here and am not contemplating a move). Since we travel frequently, a central location would be better. The Bay Area would offer much-improved access to our clients and to an established talent pool. There is not much of a talent pool here in Portland, and there is no strong University program providing entry-level candidates. I'm interested in helping to explore forming an e-learning cluster here in Portland. Please include me in further communications. Workshop participants—firms, aspiring entrepreneurs, relevant government and non-profit organizations—seek to explore a “cluster” approach to the growth and development of new and existing firms developing innovative technologies for the education sector. This initiative is a timely, private-sector-led response to economic opportunity—and a bit of good news to counter the barrage of negative press about education in Oregon. Leveraging both the state’s reputation as “wired” and the city’s ability to attract creative talent, this initiative seeks to build the region’s credentials as an hub of tech-ed innovation. )The education sector in the U. S.. is a promising one—the e-learning software industry alone is about US$2 billion. according to stockbrokers Jefferies & Co. Furthermore, some Portland-based education and technology businesses have been growing at 20% annually, and appear to be on the right track. Portland has more than 20 companies in this innovative space. Many of these companies—or their founders—located here for lifestyle reasons. However, lifestyle incentives alone cannot sustain a business. If there are not strong economic advantages to growing in Portland, these firms become vulnerable to takeover or merger, or seek to relocate where such advantages can be found—as many formerly Portland-based firms have done. This initiative is exploratory in nature. At this time, the economic benefits of clustering—networking and relationship building among firms researching, trading, supplying or purchasing technology goods and services in the education sector—have not yet been identified. ∑ Improved access to money—organizing could make Portland a necessary stop for financiers and promote better financing opportunities for new firms. ∑ What is the potential for collaboration or joint infrastructure creation by a group of companies in this space? ∑ What makes Portland a great place for building and/or growing a company in the ed-tech space? ∑ What degree of competition exists between Portland companies in this space? What safeguards might lead to productive collaboration on areas of mutual interest? ∑ What are the legal and public policy obstacles to a vibrant education industry in Portland? ∑ What are the roles that Portland’s Universities can play to assist the education industry? ∑ What could be learnt from Phoenix, the current center of education? Below is Niki's suggestion of a possible format for the workshop to facilitate brainstorming. Please feel free to contact Kelvin (kelvin.n.ng@msdw.com) and Niki (steckler@ohsu.edu) with feedback and/or issues that you would like to see addressed by this workshop.